This recipe is an excellent balance of protein, healthy fat and complex carbohydrates to stabilize your blood sugar and keep you satisfied. Preheat oven to 350ºF. Lightly coat sweet potatoes with cooking spray and bake for 30 minutes. Next, lightly season chicken with salt and pepper. Add oil to a large skillet over medium heat. Add chicken to the skillet and sear for 2 minutes. Flip chicken over, add 1/4 cup broth + 2 tbsp apple cider vinegar and sear for an additional 2 minutes. Transfer chicken to a baking dish and set skillet aside. Bake in the oven (at the same time the sweet potatoes are baking) until chicken is cooked through, about 15 minutes. 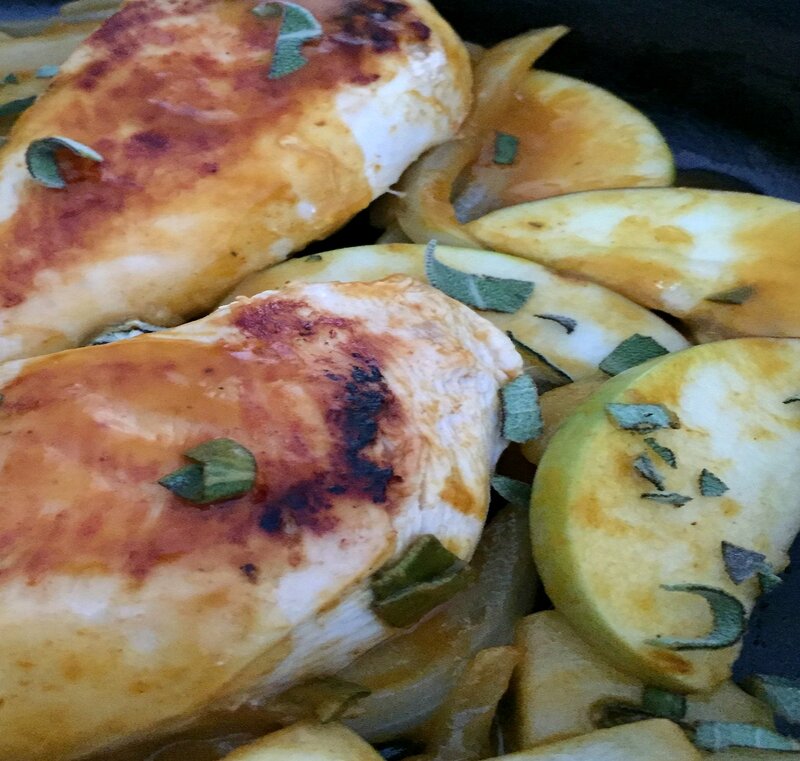 Add apples, onions, honey, remaining 1/4 cup broth and 2 tbsp apple cider vinegar to the skillet over medium heat. Allow to simmer, stirring occasionally, until apples and onions are soft (about 5-7 minutes). Reduce heat to low. Remove chicken and sweet potatoes from the oven, place in the skillet, and coat in sauce. Add sage and simmer for 2-3 minutes.